A few months ago, I reported on the Coolest Cooler, which was a cooler on Kickstarter that had just about everything from a cell phone charger and more. To me, this feels like the ultimate technologicalization (I’m totally copyrighting the word) of a color. Today, I’m talking about another technologicalization of something we all know: the suitcase. 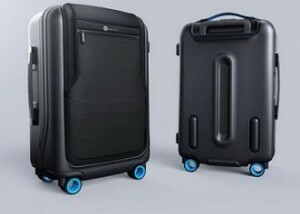 This is the Bluesmart, and it is a suitcase that can connect wirelessly to your smartphone thanks to the power of Bluetooth. This gives you the power to digitally lock your suitcase and use location tracking as well. Not only that, the suitcase actually has a scale so it can tell you how heavy your big is. This feature will come in handy for when weight limit might be a problem. Another feature is the handy charger that can juice up a cell phone about six times and can do two devices at once. The Bluesmart also has some smart features like a padded pocket for the laptop. Now, this is an Indiegogo project, but the price is currently $235. It has totally raised its funding goals.